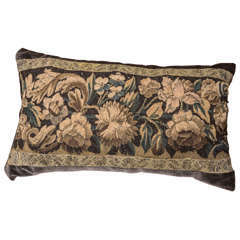 Long lumbar vintage crewel work floral pillow on textured linen framed with a plaid flange. Pillow backed with luscious teal silk velvet. Closure by hand-stitch with a custom-made down filled pillow insert. 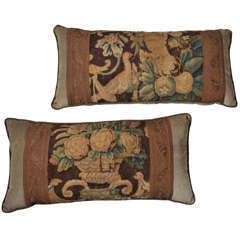 18th century tapestry pillows embellished with French gallon in a classic pattern. The pillows are backed in a lovely Ralph Lauren greige corduroy. Down filled. Only one is available. Silk floss floral embroidery on hand woven linen. European. Backing is same line without embroidery. Invisible zipper closure and feather and down fill. Pillow made from modern Turkish Kilim. Pillow made from an early 20th century Turkish Oushak rug. Green and soft red. 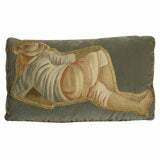 A linen and down filled lumbar pillow made for Danish teak Classics by American designer Anne Klemm Rogers. The Raoul textiles fabric showcases a woven sari pattern. Pillow made from an early 20th century Turkish Oushak rug. Pillow made from a antique Persian Serab rug.